The Comptroller and Auditor General (CAG) has also highlighted the non-utilisation of collected cess for secondary and higher education. NEW DELHI: Small amounts of money that you have paid as some or other form of cess to the government — such as education cess, Krishi Kalyan cess, Swachh Bharat cess etc. — has turned into a massive amount over the years. However, a substantial part of the money collected over the last three years has not been completely utilised, finance ministry data has revealed. For example, in 2016-17, the total amount received through cess was nearly `1,78,594 crore, of which, only `1,00,871 crore was utilised. The Comptroller and Auditor General (CAG) has also highlighted the non-utilisation of collected cess for secondary and higher education. The government might have its reasons for underutilisation, but experts say cess is like a tool to collect extra money from people and its underutilisation means an unnecessary burden on the people. Government officials blamed several factors. A senior official said, “There have been instances where proceeds from cess collection for dedicated schemes can’t be used completely due to reasons like pace of expenditure of the scheme, implementation and absorptive capacity of the department to spend.” “In such cases, the budget allocation to ministries and departments for implementation of dedicated schemes is reviewed mid-year and revised allocations made, resulting in under-utilisation in certain years,” the official added. Ministry of Human Resources Development data reveals primary education cess collected in the last three years has been used substantially. 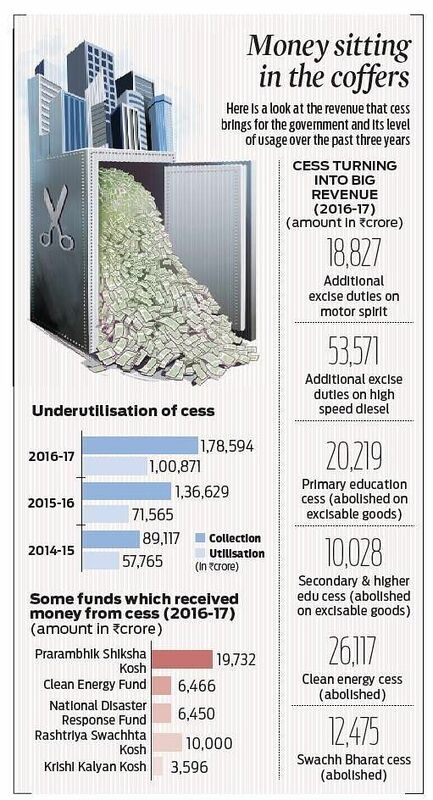 But, a large part of proceeds of the secondary and higher education cess remained unutilised.Similarly, the revenue collection under Krishi Kalyan Cess in 2016-17 was `8379.16 crore and officials claimed the proceeds had been used for meeting expenditure on interest subsidy for short-term credit to farmers and Pradhan Mantri Fasal Beema Yojna and only `3,596 crore was credited to Krishi Kalyan Kosh.